How many parts are in that box? This is a question that is asked in many different industrial situations. Any time that inventory is updated, the total number of different hardware items, or electrical components, or plumbing fittings, or plastic parts must be determined. When items are being packed for shipment, the exact number of pieces must be accurately known. When receiving accepts incoming packages, the number of parts must be confirmed. There are different kinds of machines used to count the total number of parts. Small electronic parts that are on a tape carrier stored on a reel may be counted on a reel counter. This device has two reels, and the tape is threaded between them. As the tape is advanced, the number of pieces that passes the central section are counted with either a mechanical assembly, or an electric eye, or some other method. Of course this is only suitable for this type of part. Vibratory feeders may also be used to feed small items into a container. Light beams may be used to detect the number of parts that pass through. But by far, the most common type of machine used for this purpose is an electronic parts counting scale. The scale will determine the total number of pieces on the scale platform by accurately weighing them. Of course, this method is only suitable for parts that are nearly identical to each other. First, the operator will place a known number of parts, known as the sample parts, on the scale platform, such as ten, or twenty or fifty pieces. That number of parts must be entered into the scale using the front panel. The scale will detect the weight on the platform, and will divide it by the sample size. This calculates the piece weight of a single piece. Next, an empty container may be placed on the scale platform. The tare button will be used to subtract out this tare weight. Now, an unknown number of pieces may be placed into the container. The scale will divide this weight by the sample weight. The result is the number of pieces in the container. The most important features of a counting scale are its accuracy and resolution. The resolution is most important when the sample weight is being calculated. If the scale can only determine the sample weight to within 10 percent, then the final count can only be accurate to 10 percent at best. So the scale should be chosen so that the sample weight can be calculated to better than the overall counting accuracy desired. The sensitivity should be very high. The scale should also be rugged enough to stand up to harsh industrial usage. This is usually in direct conflict with the need to have high sensitivity. Most industrial counting scales use aluminum load cells. But that material is most prone to damage from shock load. A better choice is stainless steel. This material may be machined to offer the high resolution and sensitivity required, but is better able to withstand the type of damage that could otherwise occur when the scale is bumped, dropped, or when items are roughly placed on the platform. For many situations, it is useful for the scale to be able to communicate with computers. This allows the parts data to be stored in databases or spreadsheets, or to be printed on labels with our without barcodes. Standard communication protocols include RS-232 serial data. Universal Serial Bus, known as USB, has now replaced RS-232 as the best choice for data communication. 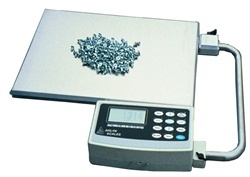 Some of the higher quality counting scales, such as the Arlyn Scales brand, offer this option. Another choice that is becoming popular is Ethernet connectivity. This allows the scale to be located at a distance from the computer. In fact, the data may be read by any computer on the Local area network, or LAN. Some more advanced scales use their Ethernet connections to communicate over the Internet. In this case, the scale data may be collected by any computer in any location with Internet access. Again, Arlyn Scales offers this capability. But in many cases, the count is used directly at the scale location. While many electronic scales use a simple numeric display, or even include legends for the type of unit, more advanced units provide a full graphics display. These usually show the results in much larger, easier to read formats. And because they have graphic capability, they can also provide menus for choosing the desired functions. This gives advanced capability, but retains ease of use.